All animals are equal, but some animals are more equal than others – Film at Eleven ! It’s Friday evening, September 21, 2018, after 5 PM and once again I’ve lost the battle in the “Find a Parking Place Roulette” in Area 30 Residential Parking Permit area. 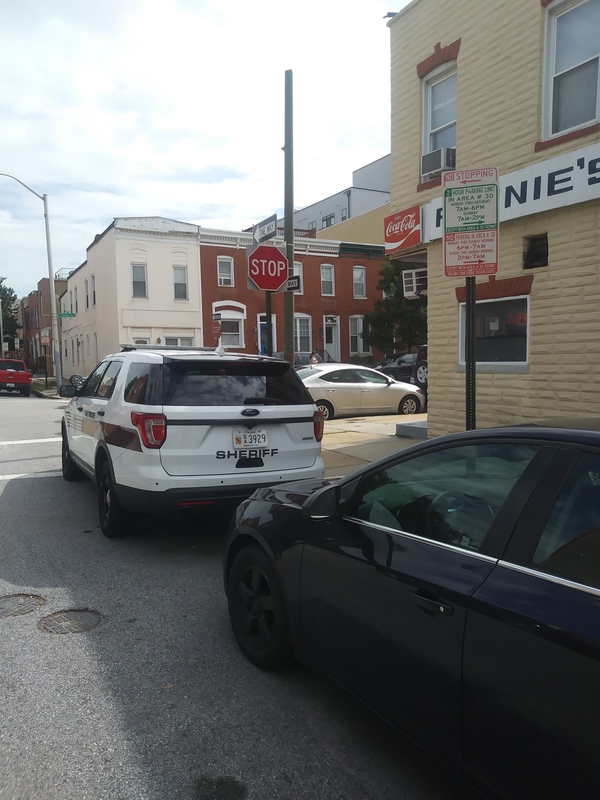 For those not familiar with the RPP Ponzi Scheme, it’s where the City of Baltimore sells you a permit to park in a designated area…not a parking place, not a guaranteed space, but a license to hunt for space and not get a citation if you find one. So let’s see…a Residential Parking Permit…means you have to live in the area…and you can not park a commercial vehicle in the area, even if it’s your vehicle. Oh yes, you can get a permit to give to a visitor who does not live in the area…but the visitor cannot park the commercial vehicle. Got it straight so far? In area 30 the regulations about permit parking are not in effect after 10PM…so a crafty person can park their car after 10 PM. But wait, there’s more….the parking control officers need to document the non permitted vehicle was parked for over 2 hours…and since they stop patrolling at 10 PM, if they notice a car illegally parked at 801PM, they can not issue a ticket at 1001PM, since they are not working then. This time warp lets the illegal parker park at 801PM and not get a citation. So what is a commercial vehicle? The obvious ones have signage with a business name. But they must be a truck…so if you own “Pappy’s Locksmith and Door Repair”, you can have your car all signed up, all commercial…and parked in a residential parking area using a permanent or visitor’s permit. So let’s see….there’s another class of vehicle that doesn’t have to follow the rules…police and sheriff cars….they don’t need a permit and can park in any no parking zone with no fear of getting a citation. Back to Friday evening…after parking about a 1/4 mile from the edge of the RPP area, I observe commercial vehicles parked in the RPP, and a governmental vehicle in a no-parking zone at the intersection of Barney and Charles streets…it’s the same vehicle that takes up space virtually every evening and more often than not is found in designated no parking zones. I’ve brought this to the attention of the department owning the vehicle several times…each time they are polite, promise to investigate and on a call back tell me the officer involved has been notified and there should be no more problems. I can only assume they must use a different version of English than mine since it’s a recurring problem. The Police Department used to park out of service patrol cars in no parking zones. The insisted it cut down crime…but it’s hard to believe that the observation owers of criminals are so poor they can not determine a patrol car with dents, rust and bad tires parked in the same space for days on end is not going to cramp their style. At least the Sheriff’s Department did not try to convince me the vehicle is a crime deterrent. So, if you live in the area and see the vehicle below as I documented around 11AM on Saturday, Septemeber 22, 2018, please join me in the “Let’s Give the Gubmint Feedback on Animal Equality” feedback.